Brother, you be that secret keeper, never more so than in death. You took it with you, those wormy insides of all of us. The debts you paid off, and the ones you didn’t. Everyone feeds you their secrets and you ate them all, big and small, growing as big as a bear. Inside that belly of yours, you grow your own secrets. Doctors blame your weight on the sleep apnea that keeps you unrested and your eyes shadowed dark. They can’t see it’s the secrets pushing at your chest, at your breath, locking the night into tight gasps. Brother, I wish you were here to help us with Sister. In grief she shrinks, then balloons with guilt. But something is not right. Her body houses a rage, but she’s so small now that it all has to come out. She screams and breaks windows. The voices come closer and closer; they burrow in her brain. She cannot shake them out. But it started long ago, this junkie ache. I think it’s in her teeth, the way they sore and fall out. I remember her teenage eyes, thick with black eyeliner. Deep red lipstick bolding brown lips. Brother, you and I were children then, years before she would feed herself sick. Sister says there is nothing wrong with her, except she needs Brother, needs Father’s attention, needs a spiritual cleanse; she keeps on saying she needs and needs. Her need is a hunger clinging to her breath. I sing silence in her presence. Brother, with you gone, Sister begins to tell Grandmother her secrets. Grandmother settles into a quiet the way only the aged can. I wonder what she is hearing besides Sister’s garbled words that won’t fit in a straight line. I think Grandmother is listening to insects pollinating Grandfather’s orange trees. She must hear Grandfather who has long since passed, rummaging in the other spare room with Uncle. They are both busy with memories, dancing, and deep-sea fishing. Brother, I wish you were here to tell me what to say when Grandmother speaks of her death. Please, make another big pot of posole to feed us warm. Grandmother craves your voice; there is too much death riding shotgun at her hips. She shuffles now a lot, feet not wanting to leave the floor. Brother, I try to get at your secrets, scratch at the edges, the white and black tiles. Grout fills my nails. I’m sticky with loss and anger. I know not to expect a straight answer. One answer always equals more questions. What you knew you took with you to that hidden place and zippered it up good. I don’t know how you did it. Kept it from girlfriend, Cousin, Mother, and Brother-friends. I long to understand the underbelly of your love. Your Bullet, makes a permanent cavity in my chest, that I’m always tending to, my little garden of loss. Some have their cemeteries with balloons, photos of smiles, and well cut grass. I have this. Brother, you are my shadow DNA. I would cut a piece of my arm off to grow you back. Plant in the soil and grow you strong. Not just for me but for Mother and Father. For Eldest Son, Daughter, and Youngest Son. Two years later after death, Mother howls in the bathroom. I hear the ache through center of the house. Running water will not contain this kind of son-loss. It is a cry that seeps into the bones of our house. Nothing will ever be right again. Brother, how many times did you slip and fall out of that shower, hand reaching for loosely hung shower curtain? What bruises were left after those falls? Do you hear Mother’s cries? The way they call out, that steady beat of hurt. I crack my bedroom door open, but cannot leave. I’m anchored to the weight of door. I tell myself if you were here, you’d know what to do. Know how to hold Mother in your arms. How to lift her head from the cold sink. You’d do it without hesitation. In loss we are constantly slipping and falling. Mother says you were her best friend. I am a hole that does not fit into the hole she is left with. Brother, Father remembers you as a brother. Somehow you had shouldered that role well. I don’t know when it happened, maybe when you became a father. Or was it the day that Father’s younger brother died. Father gets the call from Grandmother and you drive us to the hospital. We wait and wait. We wait to speak to the doctor, to speak to the priest. We say goodbye to Uncle’s large prone body. You were closer to Uncle. Spent years laughing and arguing with him as he showed you the language of engines and carburetors, delicate language of quiet listening and rough hands. A language that hums in the pads of family fingers, but not mine. It is you who drives us to Grandmother’s house with steady hands. Grandmother offers everyone around her small table a shot of tequila. You gulp it quick. Later you drive us all back home, Mother, Father, and me. Your body’s second home is a car. I am always looking for that, some extension of myself, a soft landing. Brother, your death makes grown men cry. It’s both terrible and beautiful to witness that much pain. The way throats crack and shoulders bend from love. They come looking for you in the middle of the night, for your ghost breath in the scent of orange trees that sway when city birds hover above them, clipping the air. These men with their boy-heart memories of better days when guns were thrill and aim, but not death. They come for you, half-drunk, bottle in hand, trying to dim the burn. I think they want you tell them that they are not alone. Brother, if you were here, I’d show you how sometimes it seems like these boys, who became men, who you called “brother,” are barely pieced together. This is a city of Bullets and it is always taking aim. Brother, it is three years after your death. We gather at the house, gather at the porch, gather on the sidewalk, gather up our tears, gather up words to burn together in a pit of fire. We are quick to cry and laugh at your memory as it filters through cold night air. I am soot of charred wood, burnt particle, dark evidence of my guilt that crawls up from my belly to strangle my throat. If you were here I’d tell you what I told one of your Brother-friends. I pulled him close and begged him not die, said I couldn’t bear another brother dying and neither could my parents. I sobbed into his shoulder. He held me, but wouldn’t promise me anything. Later he becomes our street preacher minus the religion. But he speaks of faith and family. He speaks of all our death and the rest of us left living. A few nights later, the windows and front doors of my parents’ house vibrate, like chilled teeth clattering. It’s the street preacher. Parked in front of our house is his lifted white truck. His stereo blasts sad songs. He mumbles the lyrics, something about why someone had to leave. There is a bottle in his hand. He tells me and Cousin that he is not really drunk. He doesn’t know if that is good or bad. I reach to hug him and he bends into me with a small sob. He’s shouldering more pain than most. Murder of a biological brother. Death of parents. Death of Brother. More Death. He says, Sometimes when my kids turn on a sad song like this, I’m done for the day; It’s hard for me get out of bed. Later he says he doesn’t want to hurt someone’s family the way we hurt. And I know what he’s telling me. The words behind the words. The guilt of not retaliating. The guilt of survival. I keep on repeating, I understand. My mouth only seems to know how to shape and hold on to those words. But there are other words I carry, but don’t have the courage to speak. Brother, could you say to him what I struggle with: The pull of drink is hard to unfurl, and he is a fist, bruising the tender around him. I no longer ask him to make me any promises, but wonder, would he make you promises? Brother, if you were here I’d tell you my own secret. Since you’ve been gone a man told me he loved me and I learned to love him back, but he was not mine to love. How ashamed I was to love. But afterwards I cried because I thought I would never be enough. A mouth of emptiness. But how happy I was afterwards to feel again, something other than grief. To know desire, and longing at the tap of my fingertips. I mantra myself out of the tears. It ends in an angry silence. I tell myself I have survived more hurt than he could ever give me. Brother, you are my blood loss. My shadow DNA. But it is three years after and sometimes I worry that it is much easier to remember your death than life. Three years later I am living in a city with low crime, and much different than our city. In this other city it is often rainy and dark. And it doesn’t take much to remind me of that winter night of rain and darkness. Everything is wet. The tears, the blood. The rain doesn’t stop for days in our desert-like city. I couldn’t get dry. I do my best to stay dry, but some nights it is hard. I will go into a panic, when there is a man behind me and it’s rainy. When I’m not sure how I can escape, so I want to escape my own body when my follicles soldier up. There is a scream clawing at my chest. I am going back to that night. And I can’t save you. I can barely save myself. I’m all guilty instinct. Brother, help me remember you in life, that full face and thick paw-like hands grabbing me in a sisterly hug. Help me remember my Northern heart of love, that place at the mountain that curves in, like a still ache, a shelter. Casandra Lopez is a Chicana, Cahuilla, Luiseño, and Tongva writer raised in Southern California who currently lives in Seattle. She has an MFA from the University of New Mexico and has been selected for residencies with the Santa Fe Art Institute as well as the School of Advanced Research, where she was the Indigenous Writer in Residence for 2013. 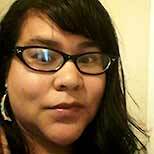 Winner of the 2013 Native Writers Chapbook Award from the Sequoyah National Research Center, her work can be found in various literary journals. She is a CantoMundo Fellow and a founding editor of As/Us: A Space For Women Of The World.